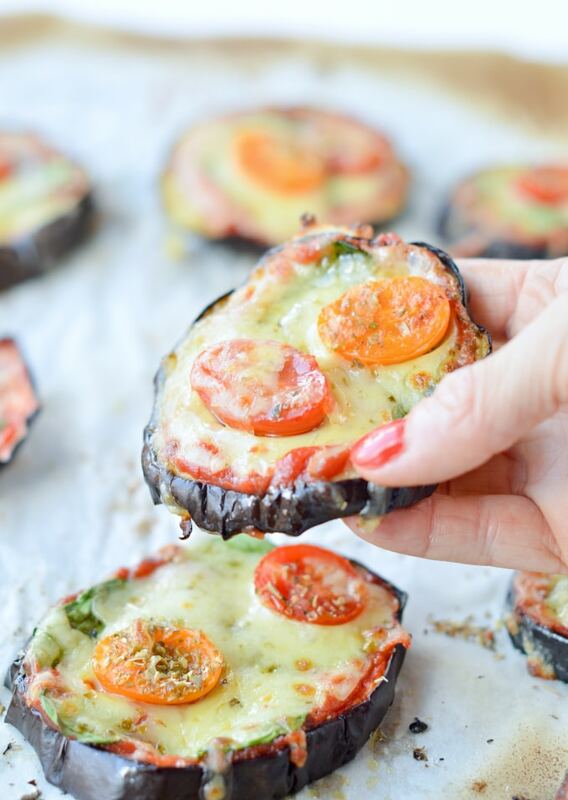 Eggplant pizza bites are easy vegetarian low carb appetizers made of baked eggplant, tomato sauce, spinach and cheese. A simple delicious gluten free appetizer that can easily be vegan-ized using ‘vegan cashew cheese’. You know how much I love fun finger food that involves vegetables right? Eggplant is my girl favorite vegetable and as her 5 th birthday is coming up, I am trying new fun recipes for her. She loves pizza, she loves eggplant so say hello to those delicious eggplant pizza bites. Cheese – I used mozzarella cheese but Parmesan is a great option too. My husband is vegan, for him I am using vegan ‘cheeze’ made of cashews or vegan Parmesan that I am buying in store. It pass the test of both kids tonight. Those will be on the birthday finger food table for sure with my homemade low carb tortilla chips. I was surprise how they hold pretty well in your hands. It is a very easy appetizer to serve any time and the flavor is amazing! It taste like pizza, without the crispy crust of course – but also only 1.7 g net carb per bites! The eggplant base is soft and melt in your mouth. It is not chewy at all. 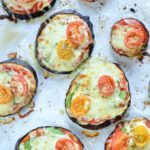 Even if you are not a big fan of eggplant, give this a go ! It is divine ! I used one eggplant in this recipe – which makes 10 slices. Of course there is mostly large bites – that I enjoyed myself ! but there is also few small bites from the top of the eggplant that are perfect for the kids hands. 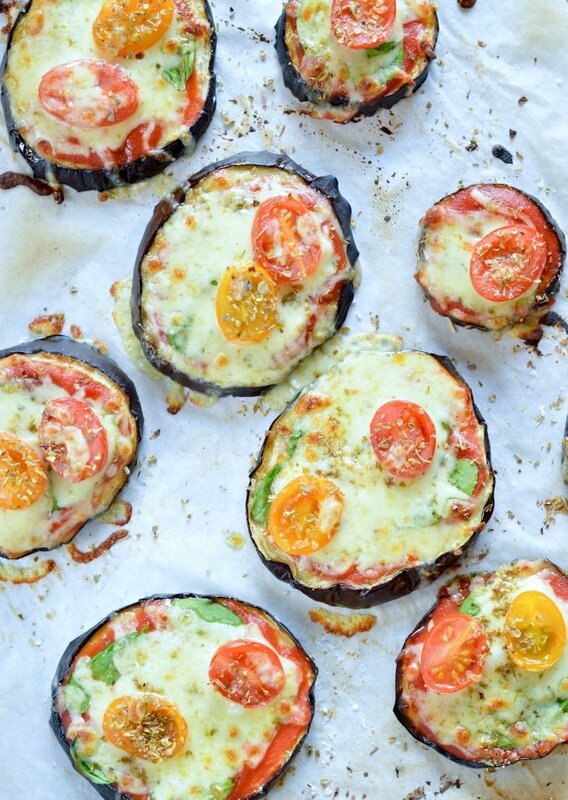 I serve this for dinner tonight and me and my 2 kids devour the whole eggplant ! Delicious ! 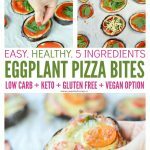 Enjoy those simple eggplant pizza bites and tell me what is your favorite topping ? 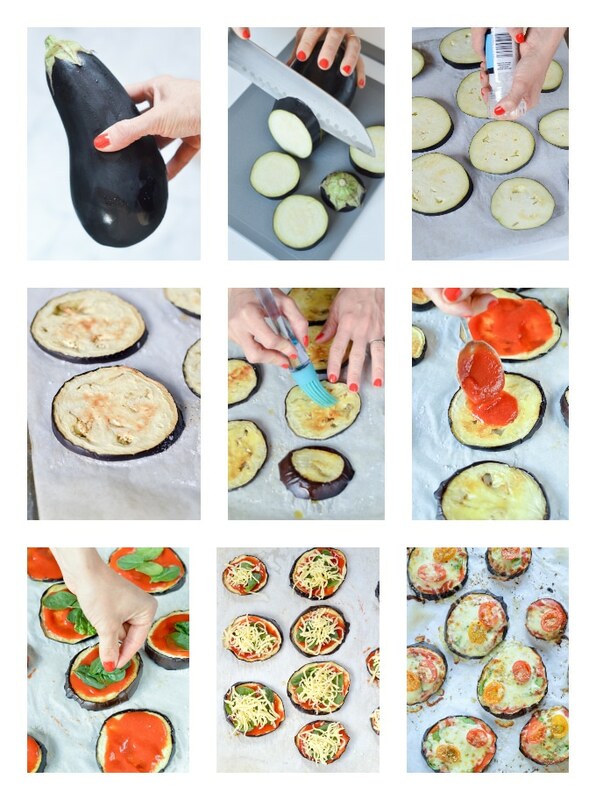 Prepare a baking sheet covered with parchment paper and arrange the eggplant slices on the sheet. Make sure they don't overlap or touch each other. Sprinkle the coarse sea salt on top. Set aside for 10 minutes. then bake for 15 minutes at 220C (425F). Remove the baked eggplant slices from the oven, flip over the eggplant slices and switch the oven to broil/grill mode. Brush some garlic olive oil on top of each eggplant slices - this is optional, I just love the extra flavor and moisture it adds to the slices. 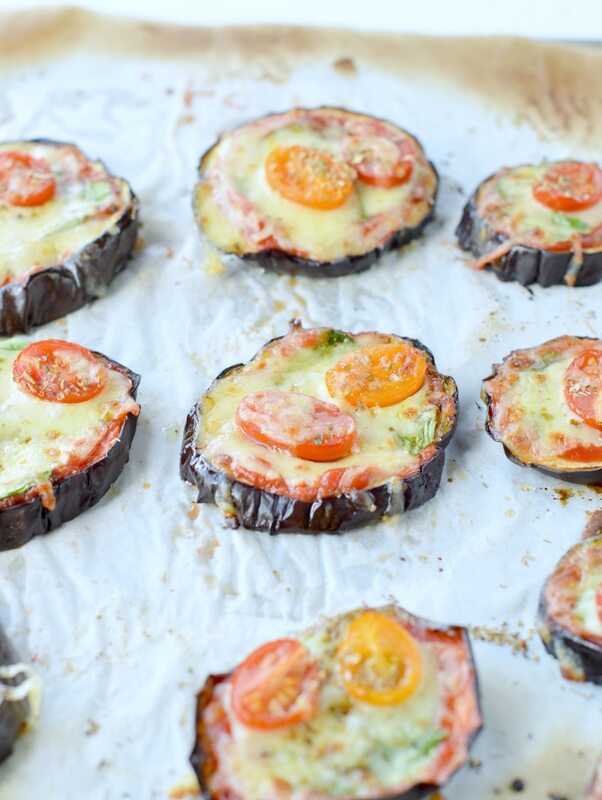 Spread about a tablespoon of tomato sauce over each eggplant slices. Then, add your favorite toppings : few baby spinach leaves, grated mozzarella cheese and half cherry tomatoes. Add a sprinkle of dried oregano and return to the oven, broil mode, for 3-5 minutes or until the cheese is grilled and melted. Make ahead: you can pre bake the eggplant slices the day before, store in the fridge in an airtight box. Rewarm for 5 minutes a 150C (300F), then spread the toppings, broil cheese and serve! Veganised me ! use vegan cheese in this recipe to make it vegan. My husband is vegan and loves vegan Parmesan or vegan cashew cheese that I make myself or even vegan 'mozzarella chee-ze' from the store. Nutrition panel is for the whole eggplant turned into pizza bites. One eggplant serve 1 dinner. This sounds like an awesome recipe. Can you freeze them once made? Hi! I would not freeze them Eggplant are very soft and may get soggy after freezing. But as I said in the recipe you can pre-bake the slices few days before and store in the fridge. It store well for 3-4 days. Enjoy the recipe! XOXO Carine. Don’t be anxious ! Those are all easy to make. 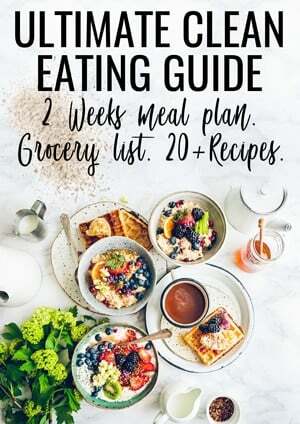 Enjoy the easy vegetarian recipes on the blog. XOXO Carine. These turned out so great! I used two eggplants so I could have leftovers for lunches this week. I also made them a few different ways for verity! I made some with tomato sauce and vegan cheese, home made pesto and feta cheese, tomato sauce and goat cheese, and a few with a combination of the two sauces and different cheeses. I enjoyed having different ones to chose from so I don’t get sick of eating them. My favorite were the tomato sauce and goat cheese ones! They were soo easy and delicious! I love all your toppings idea, specially the pesto one, I am a pesto lover and never thought about adding this to those eggplant pizza bites. Such a clever flavor combo. Thanks SO much for trying my recipes and sharing with me all your ideas. Can’t wait to try this too. Enjoy the blog recipes. XOXO Carine. is each slice of egg plant really 1.7 carbs? im diabetic thats why im asking. These look really good so I am going to try them. Do you know the breakdown per serving for calories and fat? Serving about 4-5 slices. I log all of my food for dietary purposes so accounting for carbs, fat, protein, and total calories is important to me. Full nutrition panel appears after the recipe card, scoll down for details Enjoy the recipe. XOXO Carine. Very delicious, but I prefer to eat it without olive oil, thanks for the article.